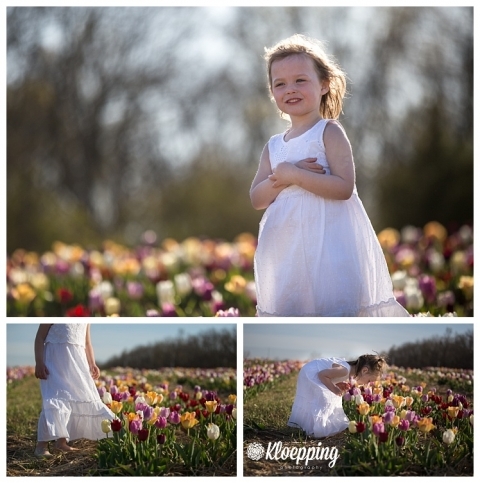 Every year I see photos from my fellow NoVa photogs of their children and clients in a sea of flowers. When I ask they always say – Burnside Farms! Little did I know that this place of beauty is a mere 10 min from my house (don’t let the Haymarket address fool you!). So, given its proximity and beauty, it has been on my to do list for a while. This year we finally made it! Burnside’s Festival of Spring lasts for just over a month depending on the weather so it makes it quite a busy place, especially on the weekends. However, if you can find time on the week nights or early weekday mornings, you can sometimes find places in the fields where you have them to yourselves. We actually went the day after their opening day – a Friday evening and had the place mostly to ourselves. I have a feeling that folks are just waiting for a week or so until more are in bloom. Lucky for us! I picked the kids up early from school (well…4:30 instead of our normal 5:30) and dressed them up. Thank goodness they’re easily bribed! I was really anxious to try this out and knew I had to try it on them first. This year both daffodils and tulips are in bloom at the same time (in the past daffy’s have started earlier than tulips but the weather threw everyone for a loop). So we have so many options when we arrived. As usual, Lia was the easy one. She would sit and pose and just generally amuse me. Noah was a bit harder but did get into it when I promised him time on their bounce pad afterwards (they have a HUGE air filled bounce pad up by the picnic areas (which, incidentally are in a nice shady spot for those wanting to enjoy a picnic on the grounds). We walked down to the far side of the tulips to start – baskets in hand and ready to pick. I’ll caution you, once you show the kids how to pick the tulips – be prepared for a huge bill:) You pay per stem and it’s really fun and easy to keep picking. I think we ended up with $30 worth of flowers to get out of there. After some time in the tulips we walked over to the daffodils – at that point they were pretty much done so I got a few of Lia but they really really wanted to get to that bounce pad. I figured a little break while the sun set a bit wouldn’t hurt so we set out to bounce. I did convince them to take one more trip to the far side of the fields for me and I think those are some of my favorites! The sun was lower in the sky and the shadows not as harsh. People wonder why I want to only shoot in those evening hours – the light is why! Sooo much more flattering and beautiful in the evening hours.